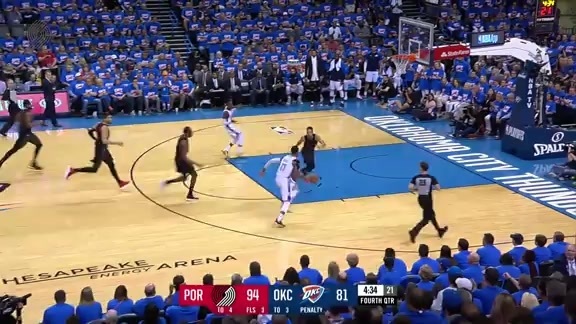 PORTLAND -- When the Trail Blazers head coach Terry Stotts decided to start rookies Anfernee Simons and Gary Trent Jr. along with Jake Layman, Skal Labissiere and Meyers Leonard, the assumption was that they would rather lose, setting up a first-round matchup with the Utah Jazz, than win and face the Oklahoma City Thunder, a team that swept Portland this season. And when Portland trailed 87-62 at the halftime intermission, that assumption looked correct. But you know what they say about assumptions. Despite relying entirely on the deep bench and playing just six players, the Trail Blazers outscored the Kings 74-44 in the second half to come away with a 136-131 victory in front of a sellout crowd of 19,814 in the final regular season game of the year. “It was a hell of a game," said Trail Blazers head coach Terry Stotts. "I was really proud of those six guys who played. The NBA is a funny game and obviously at halftime, it didn’t look like we had much going, defensively in particular. But like I said, I was really happy for the young guys to get a chance to play. I thought they acquitted themselves very well and it was a really good opportunity for them and they took advantage of that." The Trail Blazers finish their 2018-19 campaign with a 53-29 record, their best record since winning 54 games during the 2013-14 season. Portland went 32-9 at the Moda Center, won 14 of their last 17 games and end the season on a three-game winning streak. 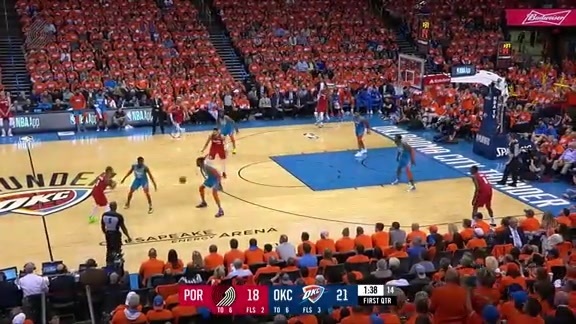 With the win, the Trail Blazers take the three-seed in the Western Conference and will face the six-seed Oklahoma City Thunder in the first round of the 2019 NBA Playoffs. Game One is scheduled for Sunday at 12:30 p.m. on ABC. "They're a good team," said CJ McCollum, who sat out Wednesday's regular-season finale. "Obviously they beat us four times in the regular season, so got to go out there and be ready to play, try to protect home court, be ready to compete." While a loss would have set up a matchup versus the Jazz, a team Portland split the series 2-2 with this season, Stotts said he opted to play just six players, most of whom have seen little more than garbage time minutes this season, for no reason other than rest, rather than picking what they might have deemed a better matchup. “Honestly, the thinking was to give our guys rest," said Stotts. "Dame and CJ obviously were initially ruled out, wanted to get them. Got other guys – Seth missed a game a little while ago, Moe’s been battling. Going into it knowing that those six guys were going to play – Rodney and Chief were available if there were foul troubles or we needed somebody to fill in but the plan was to go with those six guys." The Blazers were led by Simons, who, in the first start of his career, put up 37 points on 13-of-21 shooting from the field and 7-of-11 shooting from three to go with nine assists, six rebounds and a steal in 48 minutes. Simons' 37 points are the most scored by a Blazers rookie since Damian Lillard put up 38 on April 10, 2013 and is the most points cored by an NBA player in their first career start since the start of the 1985-86 season. "I'm just glad we got the win," said Simons. "We was down by a lot and I didn't know how the game was going to go but Meyers (Leonard) kept us going, said keep chipping away, keep chipping away -- especially in the second half. It felt good to get the win as well." Skal Labissiere, playing against his former team for the first time since being sent to Portland at the trade deadline, went 12-of-17 from the field for 29 points, 15 rebounds, two steals and a block in just under 41 minutes. 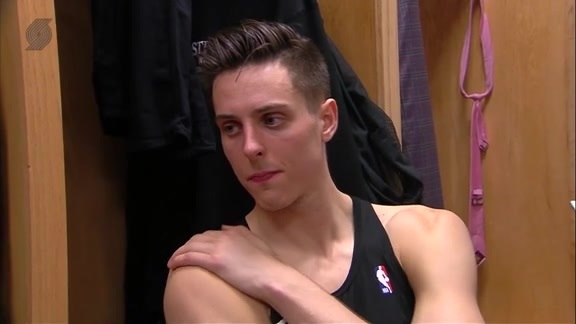 Jake Layman, Meyers Leonard and Gary Trent Jr. all finished with 19 points and Zach Collins, the only bench player to see minute for the Blazers Wednesday night, went 5-of-6 from the field for 13 points to go with six rebounds and an assist in 13 minutes. Seven Kings scored in double figures led by 20 points from Marvin Bagley III. De'Aaron Fox and Yogi Ferrell each added 17.